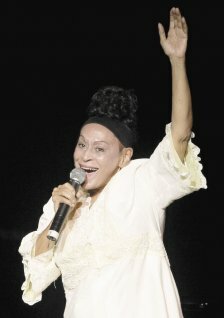 Last Wednesday August 17th Omara Portuondo premiered in Havana her 2009 GRAMMY® Award winning album Gracias, at the Teatro Karl Marx. During the one hour performance, various guests joined Omara on stage and she received gifts and standing ovations while performing songs such as "Yo vi" by Henry Salvador, and "Tres palabras", by composer Osvaldo Farrés among others. Internationally acclaimed guests, graced the stage such as, Arnaldo Rodríguez, Waldo Mendoza, Vannia and Omara's grandaughter Rossío; who charmed the packed house. The show was broadcast live via satellite on Cuban television. Visit here Montuno's Youtube Channel to watch some videos of the show.